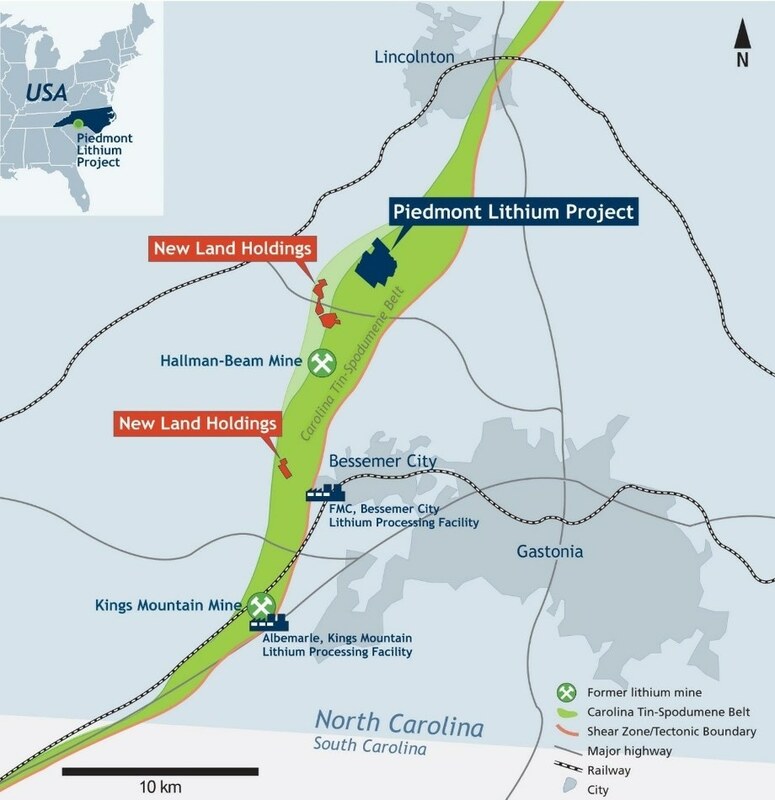 Piedmont Lithium Limited is pleased to advise that the Company has increased its lithium mineral rights by 147 acres through additional land option agreements signed with local landowners in the Carolina Tin-Spodumene Belt ("TSB") in North Carolina, United States. The Piedmont Lithium Project ("Project") now encompasses approximately 715 acres within the TSB and importantly the Company is working towards consolidating the region between the newly optioned and historical landholdings. All additional landholdings show prospective sources of additional pegmatites similar to what is found within the remainder of the Project. The Company expects to be in a position to report on additional landholding agreements towards the end of the year. Keith D. Phillips, President and Chief Executive Officer, said, "These latest agreements increase our land holdings in the prolific Carolina Tin-Spodumene Belt by over 26%, and we are in conversations with many other landowners to further consolidate our position in the region. These strategic land acquisitions are all on-trend and enable us to grow mineral resources over time, ultimately leading to greater throughput and a longer mine life." Soil sampling is scheduled for the coming months to identify drill targets on the newly optioned properties. Piedmont, through its 100% owned U.S. subsidiary, Piedmont Lithium Inc., has entered into exclusive option agreements with local landowners, which upon exercise, allows the Company to purchase (or in some cases long-term lease) approximately 715 acres of surface property and the associated mineral rights from the local landowners. The new property being the subject of this announcement has been secured on substantially the same terms as the Company's existing option agreements.